The whole weekend it was raining cats and dogs when actually it is “supposed” to be Spring, almost beginning of Summer here in UK!!! As usual, the weekend was cloudy, windy and gloomy. We ended up staying at home, cuddled under blankets and watched movies one after another. After our usual junk food eating sessions in Friday, we craved for something homely and comforting. When it comes to comfort food, nothing can compete with simple Tomato Rasam Rice and Palya. Apart from usual palya which is nothing but a stir fried vegetables tempered with urad dal, chilli and mustard Amma used to make special Peas-Cauliflower Palya. This is a special dish because each floret is cooked in a tangy tomato puree and sweet coconut cream which gives it a unique flavor. Loaded with antioxidants, fiber and crunch, cauliflower has been my favorite vegetables for as long as I can remember. For a kid who used to run miles away when it came to eating vegetables, it was a small relief for my Amma and she used to cook Cauliflower in different ways so that my love affair with cauliflower was retained;) So whenever my hubby and I crave for something different from usual stir fries we prepare this dish. Clean and cut cauliflower into medium florets and keep them aside. Grind tomatoes, coconut and rasam powder into smooth paste without adding water and keep it aside. Heat oil in a pan and add urad dal, mustard, dry red chillies, hing and curry leaves and sauté them. When mustard starts spluttering, add cauliflower, green peas, slit green chilli, salt, jaggery, turmeric powder and 1 cup water. Cover and cook for 5-7 minutes. Add ground masala and mix well and cook cauliflower for another 5-10 minutes until done. Adjust the spiciness according to taste by adding more rasam powder or chilli powder. Garnish with chopped coriander leaves before serving hot with chapatti or rice. Natural chemicals found in soya beans and vegetables such as broccoli, cabbage and cauliflower boost the body's ability to repair damaged DNA and prevent cells turning cancerous. High in fibre, more nutritious raw, especially high in Vitamin C, also rich in potassium and a source of protein, phosphorus and calcium. Food writer Mark Bittman quoted a Cornell University study, stating that 100 grams of cauliflower had 55 mg of vitamin C after boiling, 70 after steaming, and 82 after being cooked in the microwave oven. To retain the flavor of cauliflower and minimize nutrient loss, cook it rapidly by boiling or steaming. Overcooking cauliflower diminishes the nutrients significantly. just kiddin', I love my kiddos! hey sia, looks like the weather really kept u indoors eh? but we get to see this beautiful yellow & green veg :) gobi matar, such a classic combo, i too make it similar, but without coconut, will try ur version :) btw any good movies? Why I always thought you live in US.. anyways thats a really lovely recipe of cooking cauliflower in tomato and coconut cream..
Sups, dear, this palya looks fantastic! I have a cauliflower at home, next week i'll try it your way. and whats this, no Bekcham ;) Aha, thats only reserved for aloo-gobhi :-D. Lekin yaar, Beckham ji bura maan jayenge :). and yes, simple food can sometimes be the most delightful! 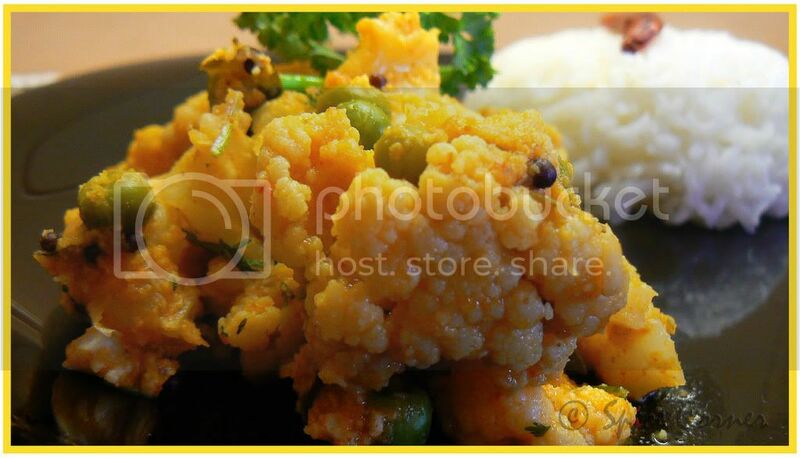 hmm cauliflower palya, our all time favorite. whenever there is cauliflower i don't have probs to force my kids to eat vege gotta it has a special place in my kitchen. This recipe is so different from all the gobhi sabjzis.The Rasam powder must be adding a spicy touch to it.I am bookmarking this one. Photos too good. Your pictures are just beauuutiful Sup... the presentation is superb! My vote goes for the second photo - the bestest of all! rasam powder must be a different taste in the stir fry. pics look awesome. Never got to be in blankets and watch movies ever since Adi is born:) envy you grhhhh..
Love the photos Sia.New camera? Enjoy,hope you called your mom yesterday.Are you cooking for Andhra or what? Waitng!!! no good movies...all were total crap except for "bheja fry". nice movie but a remake of french movie. 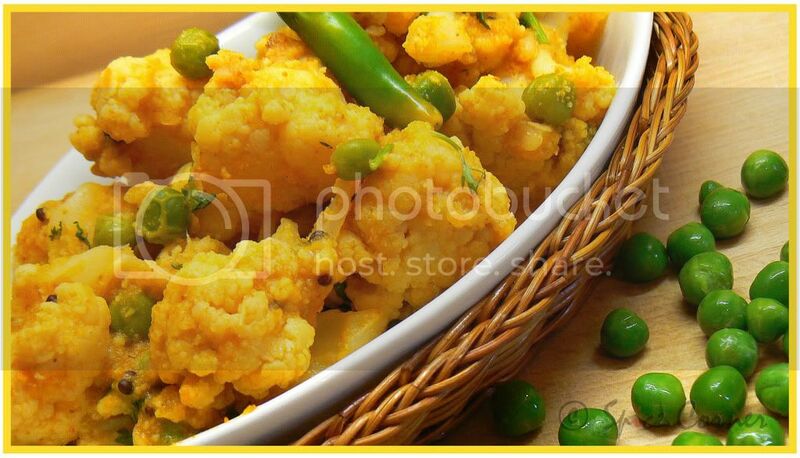 Cauliflower with rasam powder! now that is something I should try. Great pictures SC. Cauliflower with rasam! that's new to me... this is gr8! I must try asap!! BTW.. how do u get those cool pix!? I take maybe 100 snaps, select one out of that - even that is not too good! Beautiful pics Sia. Most of the curries I make has sambar powder in it. Using Rasam powder sounds interesting. The way you described using tomato puree and coconut cream makes me want to try it soon. Onece again, lovely picture. Hey, the cauliflower palya looks gr8!!! Very colorful... and gr8 pictures. Another must try recipe!! my hubby also mixes rasam powder in so many recipes.I too know in U.K. how the weather will be. the curry is looking good.thanks for the info about cauliflower. Ahhh Sups, you make me J, weekend spent in such bliss , what movies did you watch ? Your cauliflower dish sounds delicious, I too love cauliflower so much that don't consider it much of a veggie :) What does Palya mean ? Gravyish dish ? Oh yeah, this is a comfort food that you can afford not to be guilty about. Looks good Sia. he he...i have cool camera which does 90% of my work;) i use panasonic dmzc7 which has got good feature for food photography. i guess the picture quality depends on the camera u use mansi. which one u r using at present? watched quite many movies san. i guess around 4-5 movies;) among them we liked a hindi movie called "bheja fry" which is a remake of french movie called dinner guest. palya means dry dish. its usaually a stir fried vegetables tempered with urad dal, mustard and red chillies. Isn't the weather diabolical? I've had the heating on and it's nearly June!!! You are absolutely correct.Nothing can comfort sometimes just with rasam rice with veg.curry. Palya looks rich and simple too..Thanks for sharing. Wow, Sia...that looks wonderful...can't wait to try the dish soon. Do you or your mom have a Rasam Powder recipe...or do you just buy the packaged spice mix? Also...what happened to your music...I love World Hindu Chants and have been trying to find both CDs to no avail in the US? As you can see, I'm no longer a ghost...your site has inspired me...who knows...maybe I'll put together my own blog soon. unlike Mark Twain, I love cauliflower, heehee! Your palya is gorgeous!!! I've been served something very similar at restaurants (but I'm bad at memorizing foreign names). And after reading through your recipe, I'm quite sure yours pretty close to what I want, I must try it out, which sounds too good and I won't give it a miss! thanks sweetie:) haven't seen u posting regularly...r u busy or on break? In a heavy bottomed pan dry roast all the ingredients (except turmeric powder) separately until they give strong aroma. Grind these ingredients into a very fine powder in a food processor and store them in an air tight container. the music in my blog started giving some problem. many fellow bloggers complained saying it took long time for my blog to download. so i had to remove it. i will put back those "divine chants of ganesha" again. u should be able to get the Cd online. check it in amazon or on ebay. i remember seeing some copies there. What a quote!! LOL!! Rasam powder in cauliflower, never imagined!! But tempting....!! Raining there?? Its 40 deg in Dubai!!!! Roasting here, and the worst is yet to come! Hi Sia, very interesting receipe. Will try this weekend. Btw,you can now visit taste of mysore. Its ready with its first receipe Akki rotti with dill leaves. hi Sia ..the picture looks very tempting..use of rasam powder is new to me...do drop in at my blog..
Hi Sia, I love cauliflower, all preparations of it! 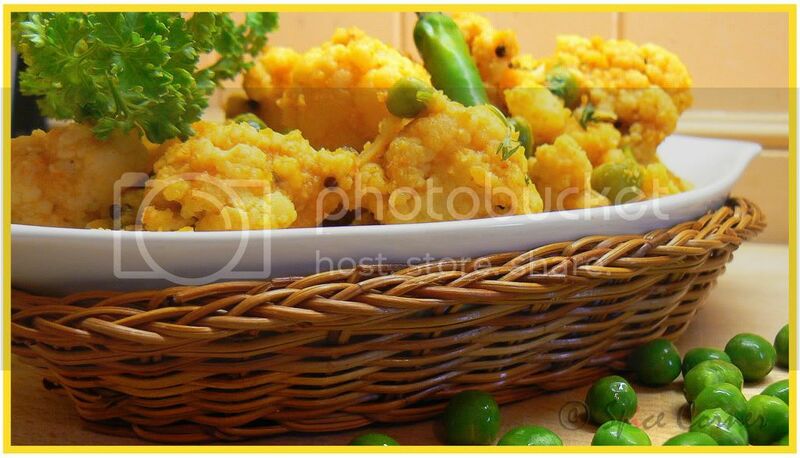 Yours looks lovely, very simlar to a maharashtrian style gobi my mother makes. Thanks for checking up on me. I am having some problems with blogger and can't upload any pics, so no new posts. Still trying to figure out what's happening. I am doing just fine and having lovely time with my in-laws. Been a little busy ...just dropped by to check your blog and had to drop a few lines. The presentation is just amazingly eye catching. Lovely loved the 2nd and 3rd picture very much. How ya doing? How is K? Gardening yella shuru madiddeya ee sarthi...will mail you soon. Cauliflowr and peas reminds me of winter!but I can eat it all year round:)looks great. Very nice recipe Supriya.. can we use sambar powder instead of rasam powder(cos that what I have right now...)My husband doesn't like cauliflower and I love it.. what ever I make with cauliflower he is not happy with it. ... once I tried priya's cauliflower masala and he liked it. so only that I make nowadays. Ur recipe sounds good to me and I was looking out for some recipes of cauliflower which goes well with rice.. I think this will.. will try it out and let u know. thanks. u must post ur maharashrian gobi recipe girl. hope u r able to post pics now. i have left long comment in ur blopg abt this. Hey Supriya.. U know what, I read this recipe in the morning and cooked for lunch... It came out very well and my MIL and husband liked it very much. I used the sambar powder to make it and was easy to cook too. we had it with rice and sambar and aws very tasty. I will post the pic sometime on my blog and this is going to be a regular one in our house..(u know my MIL also noted it down in her book). thanks supriya for sharing this recipe. i am thrilled to know that. thanks for letting me know girl. 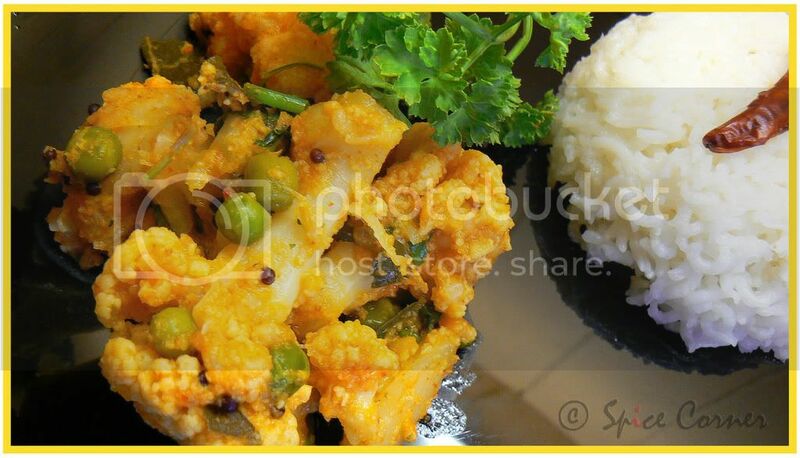 this is our fav dish too and we cook it quiten often as we like cauliflower:) amma's recipes hardly go wrong right? I just came across your blog when I was searching for a recipe for cauliflower Palya...Awesome blog...I liked all the recipes...esp some of the simple ones..And also some typical kannadiga dishes like majjige huli..I have very lil experience in cooking , I have just arrived in the US and now I have no way out......Just wanted to say thanks and keep it up! 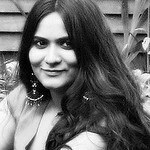 Like I always say..loved your pics..the light in it.Thats a so colorful n healthy dish Vani..I love crispy cabbage combo-ed with anything..n peas is ofcourse a fav of mine.Nice to be visiting your blog.I read your blogs regularly.Wish you best of luck.